In celebration of the Alvin Sherman Library's 10th anniversary, we honor the theme LITERACY. Recent statistics from the Literacy Coalition of Broward County, indicate that 22 % of Broward County residents are illiterate. We know that by reaching children early, we can help break the cycle of illiteracy. Our goal at the Alvin Sherman Library is to begin enhancing the love of reading and learning through rich programming and events. For example, our Family Literacy University, encourages early literacy for children starting at birth. The program include: Sharkey's Storytime Fun and Little Minnows followed by a session for parents which provides tips and tricks to get your child ready to read. In addition, our Live at the Sherman Library fosters a love for culture through rich interactive performances. The Alvin Sherman Staff is committed to stomping out illiteracy with innovative and enriching programs that serve everyone. 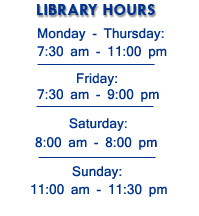 Our programs are free and open to the public. In addition, anyone working, living or going to school in Broward County may apply for the greatest gift ever...a library card. 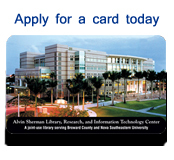 Help us stomp out illiteracy by getting the word out about the Alvin Sherman Library. Together we can make a difference in someone's life...one book at a time. In celebration of Black History Month, view our library guide which offers you a quick snapshot of the library's Black History resources. Mar. 7 - Woof! Arf! Bark! Join us for books about dogs! Featured books include Bark, George by Jules Fieffer, Dog by Emily Gravett, Always in Trouble by Corinne Demas, I Don’t Want a Posh Dog by Emma Dodd and Biscuit by Alyssa Satin Capucilli. Make a doghouse craft! Mar. 14 - Get Ready for St. Patrick’s Day! Get Ready for St Patrick’s Day with an Irish-American themed storytime with stories and songs about luck, limericks and leprechauns. Mar. 21 - Girl Power! Celebrate Women’s History Month with books by your favorite female authors! Featured books include Rhyming Dust Bunnies by Jan Thomas and Five Little Monkeys Jumping on the Bed by Eileen Christelow. Mar. 28 - Here Kitty, Kitty! Join us for books about cats! Featured books include Cat Secrets by Jef Czkaj, Mama Cat Has Three Kittens by Denise Fleming, and So, what’s it like to be a cat? By Karla Kuskin. Inspire your future reader at storytime and experience the sounds and structure of language through rhythm, rhyme and repetition. Join us for stories selected just for children ages 6-36 months old. Celebrate Dr. Seuss’ Birthday with stories, songs and a cupcake party! Featured books include The Sneetches by Dr. Seuss and I Can Lick 30 Tigers Today, and other stories by Dr. Seuss. Get ready for the FCAT! Learn how to access online resources to help you get ready for the big test. Parents are welcome! Celebrate 10 Years of Literacy at the Alvin Sherman Library with a fun-filled day of puppets, storytelling, and crafts for kids! Classic tales including the Bremen Town Musicians, Rapunzel, and Snow White come to life in this classical 19th century melodrama. 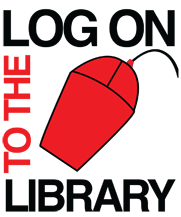 Thanks to the Charles P. Ferro Foundation for its generous sponsorship of the Live at the Sherman Library series. This exciting (and sometimes scary!) classic tale by the Brothers Grimm comes to life in this stunning modern dance performance. Celebrate the spirit of St. Patrick’s Day with Celtic crafts and music. Meet Lisa McCarthy author of the children’s book The Money Tree, and learnhow to be a money smart kid by saving money andspending wisely. Register online or call 954-262-5477 to reserve your spot. Come meet Fred the Head and learn about the 4 lobes of your brain through an interactive talk where you can touch and feel what's going on inside your head! Brain crafts and stories will also be featured. Presented by the Farquhar College of Arts and Sciences. Teen Tech Week: Geek Out @ Your Library! 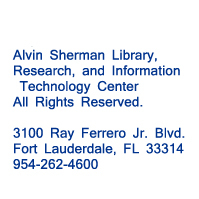 The Alvin Sherman Library invites you to Geek Out @ your library! This year's theme showcases the outstanding technology we offer, from services such as online homework help to resources like e-books, movies, music, audiobooks, databases and more. Several special tech-related programs are planned for the week. Call the library at 954-262-5477 for more information! Like us on Facebook and get a free pair of earbuds! Use your cell phone, tablet, or a computer to show any librarian that you 'like' our Facebook page! Available to participants ages 13-18 while supplies last. Teen Tech Week: Make A Meme! Enter our meme-making contest by creatinga meme that is related to the library or the Teen Tech Week theme: Geek Out @ Your Library! Learn to create simple memes using popular images or one of your own! Submit your meme via email to novalibraryvolunteers@yahoo.com and your meme could be displayed in the Teen Room! Top 3 memes will be chosen. Memes may not contain any offensive or suggestive images or language. Teen Tech Week: Game Night! Stop by our programming room to play the Wii, XBOX 360, and PS3! Check out games from our collection and play what you like! Gain confidence and experience in using the basic features of Excel. Prerequisite: Competence in using keyboard and mouse. Join us as Chef Bil Mitchell creates Irish dishes to whet your palate. Chef Mitchell is the first promoted Apron's Resident Chef of Publix and teaches regularly at the Plantation Publix Apron’s Cooking School. He has worked and managed various regional and seafood restaurants in New York, Ohio, Virginia and Florida over the last 26 years. Nova Southeastern University Professor Barry Barnes explains how the Grateful Dead were masters of improvisation in their music and business. Reservations required, walk-ins not permitted. LitLIVE! is a series of lectures, book sales and signings by some of our nation's best selling authors.LitLIVE! is in conjunction with the Broward County Literary Feast and is free and open to the public, from 12:30-5:30 pm. Join astronomer Janis Hernandez, former Associate Director of the Miami Space Transit Planetarium, in her quest to unravel the mysteries of the Universe. Get an update on the American Space Program focusing on the Cassini Mission to Saturn, the New Horizons Mission to Pluto and The Voyagers “Outer Space” Mission launched in 1977. The Big Read is an initiative by the National Endowment of the Arts to encourage people across the nation to pick up a good book. In harmony with that proposal, we’ll have a film screening of Zora’s Roots and a discussion of the life of Zora Neale Hurston, author of this year's Big Read selection Their Eyes Were Watching God. Become a better grant writer! The Alvin Sherman library invites you to attend it's 16th Semi-Annual Used Book Sale. Deals on pre-owned textbooks, fiction and nonfiction hardcover and paperbacks, children’s books, CDs, DVDs, and video cassettes. Join us for a film festival in celebration of Irish Heritage Month. 2:30 pm: Learn how to protect and preserve your valuable family records for future generations. Nora Quinlan, Director of Reference at the Alvin Sherman Library, will do a presentation on how to take care of your family papers, photos, books and other material.